All patterns come with step by step instructions for all skill levels of crafters. Each pattern has a full color photo and comes in a vinyl page protector. The patterns are designed to be used with our suede products. 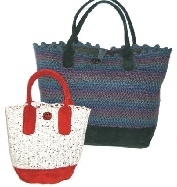 Tote Bottom, Round Purse Bottom and Tote Handles are sold separately (see “Bags” for colors and prices). Beginning at the bottom edge and working up. Working around the bag from side to side. 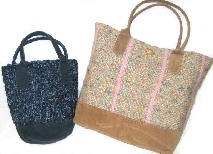 Both designs in yarn of your choice : 3 stitches per inch, 4 stitches per inch, and 5 stitches per inch. Knit from the bottom up. Knit around the bag from side to side. 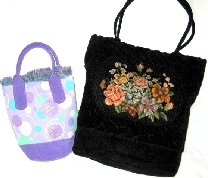 Both designs in yarn of your choice: 3 stitches per inch, 4 stitches per inch, and 5 stitches per inch. Instructions for sewing a tote or purse using almost any fabric – quilted, tapestry, needlepoint, etc. 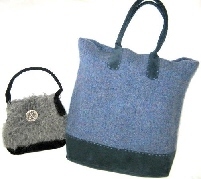 This pattern has instructions for knitting and felting the large tote bag or the small round purse using any feltable wool type yarn. Tote knit from the bottom up. 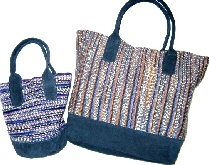 Tote knit around from side to side. Small purse knit from the bottom up. Small purse knit around from side to side.